Can you see me boogy-ing behind my computer? I really am doing a little jig...surely you can see?? Remember my yabbering about fabric way back here....yipes! 2 months ago! I hope that you didn't go blue in the face waiting for me. It is so frustrating how long it sometimes takes me to do things. There are so many ideas bouncing around between my ears. Makes it hard sometimes to concentrate on just one thing at a time. Never mind all the other things that keep me busy. I have a few of these in stock, once they are gone, I will be making them to order - which I will endeavour to have in the post within 2 weeks. I also have a plan for at least one other colour way - maybe a teal-ish sort of colour...the petals could also be leaves, don't you agree? 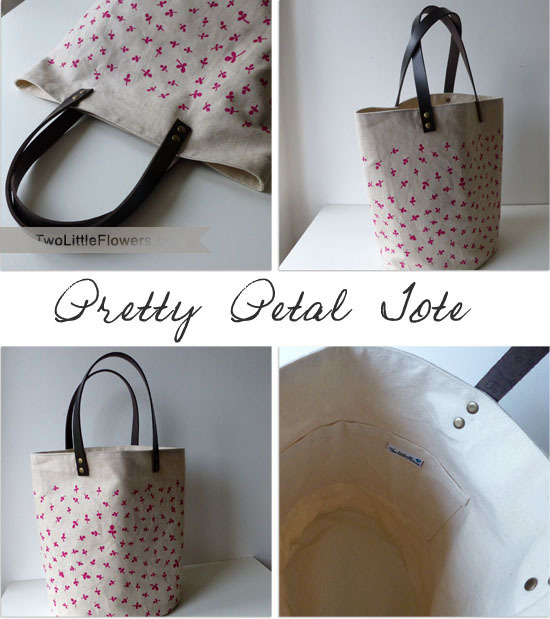 If you need to get your mitts on one of these lovely bucket totes...looky no further than here. ....I think that I need to make myself one - specifically for keeping my crochet together next to the couch...plenty of generous hooky storage!